Best known for his role in the Lahore conspiracy case, Sukhdev was a revolutionary who gave his life for the freedom of our country. In response to the death of Lala Lajpat Rai in 1928, Sukhdev Thapar along with Bhagat Singh and Shivaram Rajguru conspired against the British Government which led to the assassination of Deputy Superintendent of Police, J. P. Saunders. Sukhdev actively took part in many other revolutionary activities. He was one of the leading participants of prison hunger strike of 1929. He was hanged on 23 March along with Bhagat Singh and Rajguru. 23 March is celebrated as Martyrs' Day in the honour of their sacrifice for the country. Sukhdev Thapar was born on 15th May 1907 in Naughara, Ludhiana in Punjab to Ram Lal and Ralli Devi. From a very early age, Sukhdev witnessed brutal and harsh treatment by the Imperial British Empire on the Indian people. The British authorities ruled over the country and treated the Indians with harshness. This led Sukhdev to join the revolutionaries and their association to set India free from the shackles of the British. Sukhdev joined the Hindustan Socialist Republican Association and organized revolutionary cells in Punjab and other areas of North India. He was a devoted freedom fighter and a leader and also went to educate the youth in National College in Lahore, inspiring the students about the glorious past of India. Sukhdev along with other revolutionaries started the ‘Naujawan Bharat Sabha’ in Lahore. This organization was involved in various activities including gearing the youth for the freedom struggle, inculcating a rational scientific attitude and putting an end to communalism and untouchability. Sukhdev Thapar also took part in several revolutionary activities like the ‘Prison hunger strike’ in the year 1929. He was also an active member who took part in the Indian freedom movement through his courageous attacks in the Lahore Conspiracy Case. He was an accomplice of Bhagat Singh and Shivaram Rajguru and was involved in the assassination of deputy superintendent of police, J P. Saunders. This incident took place in the year 1928 and was for avenging the death of the veteran leader, Lala Lajpat Rai. After that, Sukhdev Thapar with Bhagat Singh avowed to take revenge and he and other revolutionaries like, Shivram Rajguru, Jai Gopal and Chandrasekhar Azad planned to kill Scott. Jai Gopal was supposed to identify Scott and had to give signal to Singh to shoot Scott. However, in a case of mistaken identity, Jai Gopal signaled Bhagat Singh on the appearance of John.P. Saunders, an assistant commissioner of police, was shot by Shivram Rajguru and Bhagat Singh while leaving the district police headquarters in Lahore in the evening on 17th December 1928. A head constable Chanan Singh was also killed when he came to Saunder’s aid. After killing John P. Saunders, they fled to places of safety. The police launched a massive operation to find out the culprits and kept a block on all possible exits and entrances. Sukhdev along with the other revolutionaries hid for next two days. On 19th December, 1928, Sukhdev called on Durga Devi Vohra, wife of Bhagwati Charan Vohra for help, to which she agreed. They decided to catch a train from Lahore to Howrah. To avoid recognition, Bhagat Singh cut his hair short and shaved off his beard. In the early morning next day, dressed in Western attire, Bhagat Singh and Vohra passed off a young couple with Bhagat Singh carrying Vohra's child on his shoulder. Rajguru was disguised as their servant carrying their luggage. They managed to escape to Cawnpore. On reaching there, they boarded a train to Lahore. In Lucknow, Rajguru left separately for Benares while Bhagat Singh and Vohra with the child left for Howrah. After the Central Assembly hall bombing incident in Delhi, Sukhdev and his fellow mates were arrested and convicted of their crime, facing the death sentence as verdict. On 23rd March 1931, Sukhdev Thapar, Bhagat Singh and Shivaram Rajguru were hanged and their bodies were secretly cremated on the banks of the Sutlej River. Sukhdev Thapar gave up his life for the country and became a martyr at an age of just 24. 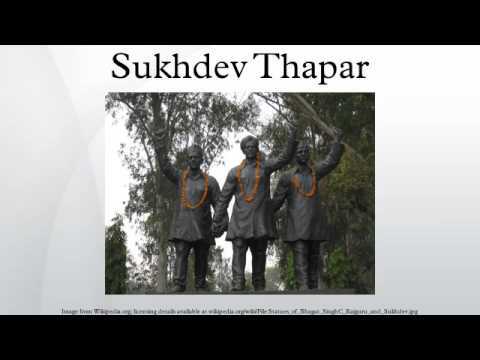 In Ludhiana, Shaheed Sukhdev Thapar Memorial Trust was established in his loving memory. In 1997 College of Business Studies (Delhi University) was renamed as 'Shaheed Sukhdev College of Business Studies'as a tribute to the revolutionary. "Shaheed Sukhdev, a paradigm of tremendous courage, patriotism and sacrifice. I bow and offer my tribute on his Birth anniversary"
"We pay tribute to freedom fighter Sukhdev on his birth anniversary"
Ek theatre artist hone keh naate seh or upr seh `gagan damama bajio ' jase natak mein shaheed shukdev ka role nibate hue bahut kuch seekhne koh mila. Bs humesha yahi sochta hu ki iss sadi mein paida hokr kuch khaas nahi kr payuga kash kash unn deewano keh sath hota toh mrte hue afsoos nahi hota km seh km kuch krke jane ki tasali toh hoti .... bahut yaad aati hi shaheed bhagat singh tumhari zarurat aaj bhi hain iss desh koh sath mein sukhdev, rajguru, baghwati bhai, shiv verma, bhatukeshwar dutt, yashpal, jaidev kapoor, yatender dass,kishan singh, chander shekher azaad, ram parshad bismil, mannawale. The outstanding contribution of Bhagat Singh,Rajguru,and Sukhdev will be remembered always by the next generations .Sukhdev primarily is to be remembered not only for his consummate courage but also for his conviction that a free government of India must set the dignity and well being of every citizen as its goal.My humble tributes to freedom fighter, Shaheed Sukhdev Thapar on his birth anniversary.